You may have noticed some minor changes to our neighborhood website recently. The purpose of these changes are to make it usable on both traditional workstations as well as smart phones and iPads. This is a multi-part process. The first part involves standardizing all the font sizes and headings on each page. Once that is complete, we will select a new template and start porting content over to t he dual-use format. Additionally, as part of the process, we are improving some usability issues. For example, similar content is being re-organized into specific menus and formal landing pages are being created. 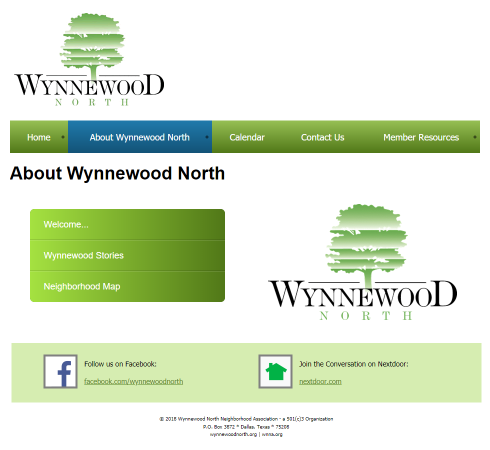 An prototype example of a new landing page can be found under the menu option "About Wynnewood North". Example shown to the right. One area where you may notice immediate change is the 'Membership Resources' menu. This menu was formally called 'Login' and held content that was restricted to neighbors only--specifically that included only the neighborhood directory and the association bylaws. The changes you are seeing now may not be permanent. Pages may shift back and forth as we delve deeper into the project. The board has a committee and process outlined for updating the site, and the activities you see are 'testing out the waters' to see some options available during this project. Stay tuned to our blog for more information regarding updates.